Sweet Peas For The Kitchen Table. Just as we long for the first of the asparagus and Jersey Royals for the kitchen, picking the first bunch of sweet peas makes me so happy. The tender stems and delicate petals look beautiful but it is the fresh scent filling a room that always raises a comment from the guests. Everyone loves sweet peas. As a child, I first remember picking them during the summer holidays in my Grandfather’s garden on the farm. He always grew a row of mixed varieties just beside the stables. It was my job to regular pick a bunch to take inside for Grannie. 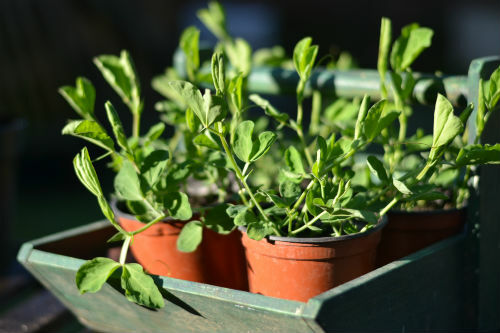 Sweet Peas are greedy plants and need quite a lot of attention. Regular watering during dry spells and a generous feed every so often will repay you with a constant supply of posies. It is best to pick every day or two and always ensure that flowers past their best are snipped so that the seed pod does not develop. If it does the plant will soon ‘go over’. 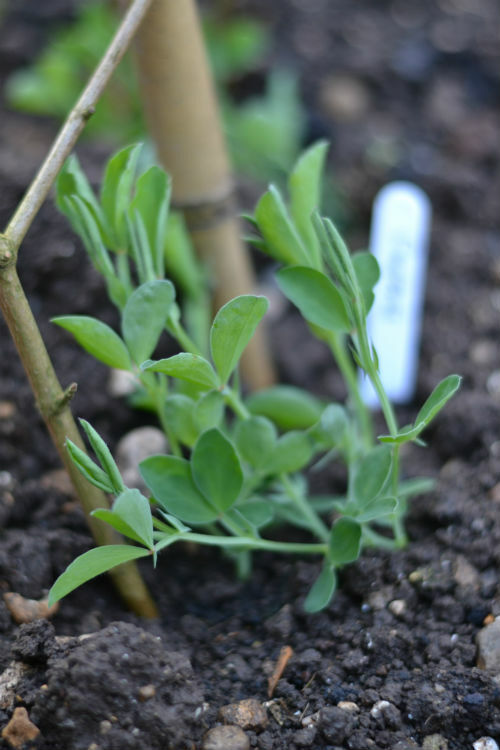 At All Hallows, Alison would always sow a couple of packets in the late autumn so that we would have established plants to transplant to the cutting garden and potager in the early spring. As soon as these were planted, the seed tin would be raided for a few more packets and she would begin successional planting throughout the summer months. 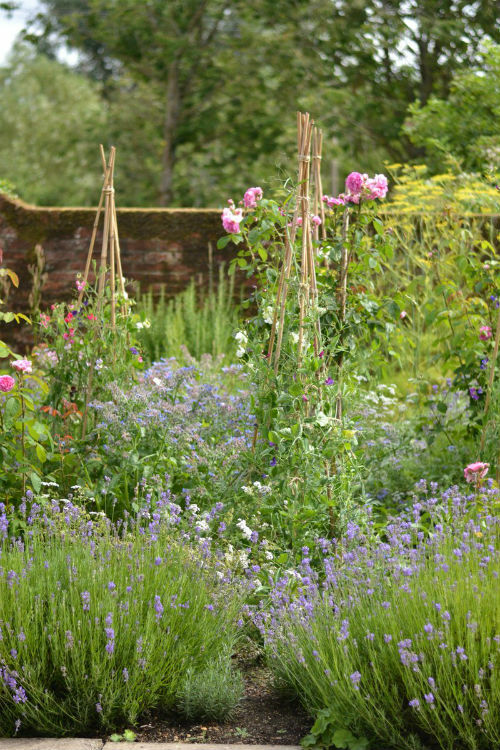 This would give us a generous supply of cut flowers throughout late spring and the summer. We even managed to keep one late sowing going until the first frosts of November. This year I planted my first few packets of seeds in December. Despite the short days the weather was mild and they germinated quite quickly. I find it difficult to be brave and pinch the tops out when the seedlings get to a height of around 6 cm.But one late February day when I went to check the hens, I could see that they would soon become quite ‘leggy’ so I took a few minutes to remove the top two leaves and hoped that they would grow stronger. The plants took awhile to recover from pinching out but as the day light hours lengthened I noticed that the seedlings had indeed become stronger and side shoots had begun to appear. From mid March, I began to lift the trays of seedlings outside during the day, but tucked them back into the unheated green house at night. About this time I also prepared one of the cutting beds that I had not had time to mulch during the winter. This also gave me a chance to lift and turn the compost heap and I was pleased to find barrowfuls of well rotted chicken bedding, kitchen scraps and grass cuttings that I could spread over the soil. Instead of the rows that may Grandfather preferred, I made three wigwams, just as Alison used to make. Whilst out for a walk, I collected some hazel sticks to place in between the bamboo canes. 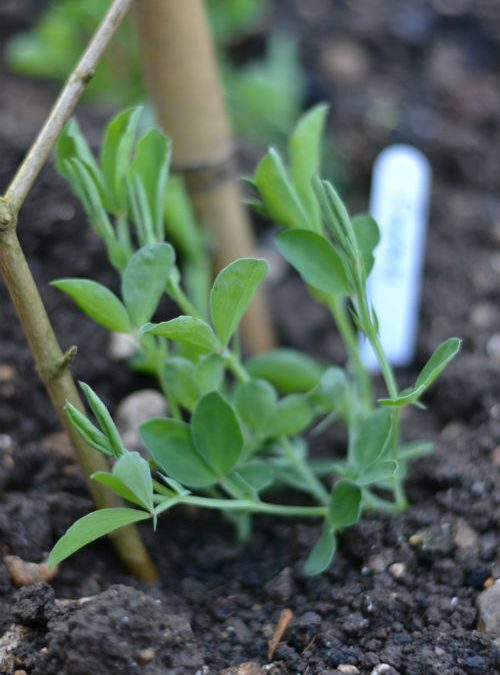 The sweet pea seedlings have been transplanted into the prepared bed beside the canes and some have already needed ‘tying in’ with garden twine for a little extra support. Now it’s my turn to search through the seed tin for a couple more packets to sow now. Instead of planting direct, I soaked the seeds overnight in a cup of water. This softens the hard outer shell and encourages germination. 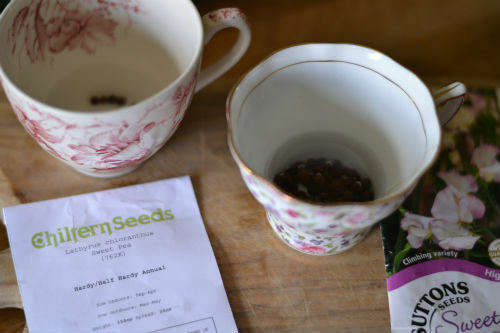 A tip that was shared to me from Chilterns Seeds. Instead of buying longer root trainer pots, I re-used clean plastic pots and planted three or four seeds per pot at a depth of about two centimetres and covered each seed with a sprinkling of compost, but remembered not to pat the soil down tightly as this excludes too much light. Finally I labelled and dated the pots, storing each variety in a separate garden tray and left inside the greenhouse.